Gullfoss is more than just a pretty waterfall, it has a story to tell. In the early 20th century foreign investors wanted to harness the power of Gullfoss to produce electricity. 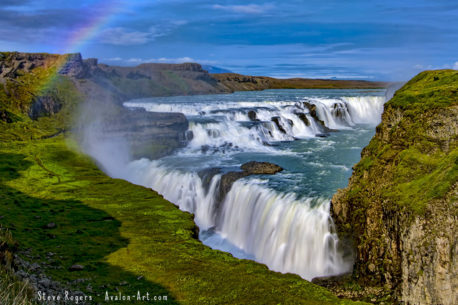 In 1907 Howells, an Englishman wanted to buy Gullfoss from Tómas Tómasson, a farmer who owned Gullfoss at this time. Tómas declined Howells´ offer to buy the waterfall but later he leased it to him. The farmer´s daughter, Sigriður Tómasdóttir who grew up on his father´s sheep farm sought to have the rental contract voided. Sigriður using her own saving hired a lawyer in Reykjavik to defend her case. The trial lasted years and Sigriður went several times barefoot on traitorous terrain to Reykjavik to follow up on her case. She even threatened to throw herself into the waterfall if the construction would begin. Her attempts failed in court but before any damage was done to the waterfall the contract was disposed due to the lack of payments of the rent fee. The struggles of Sigriður to preserve the waterfall brought to people´s attention the importance of preserving nature and therefore she is often called Iceland´s first environmentalist. In 1940 the adopted son of Sigriður acquired the waterfall from Sigriður´s father and later sold it to the Icelandic government. Gullfoss and its environs was designated as nature reserve in 1979 to permanently protect the waterfall and allow the public to enjoy this unique area.